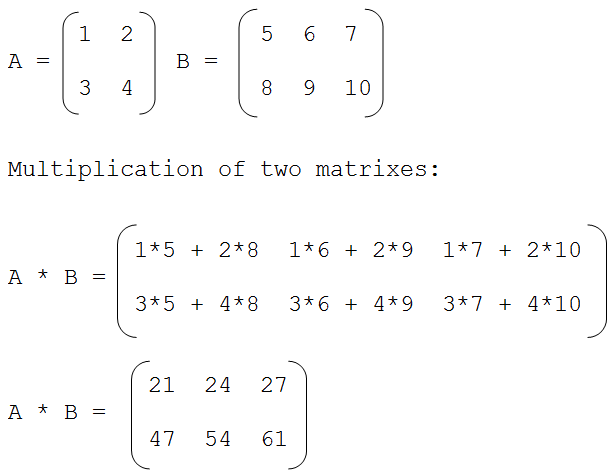 Rule: Multiplication of two matrixes is only possible if first matrix has size m X n and other matrix has size n x r. Where m, n and r are any positive integer. Can you post the program "
can i knw wat r function ? write a c program to display the elements in the matrix from any starting point it should travel upside down and also want to end at starting point. WRITE DOWN A C++ CODE TO ADD SUBTRACT AND MULTIPLY TWO MATRICES OF 2 DIMENSIONAL ARRAY USING FUNCTIONS . Wow, you guys have such great C++ tutorials. Thank you for all the open source code. It's great for development. I want the algorithm and flowchart for this program.